In a world battered by economic crisis, Sramana Mitra believes entrepreneurship is the only sustainable path forward to a healthy economic world order. And core to the success of entrepreneurial ventures today is the invigorating art of bootstrapping. Sramana Mitra–a serial entrepreneur, strategy consultant and Forbes columnist–takes aim at this essential route along the roadmap to startup success with Bootstrapping: Weapon of Mass Reconstruction (Entrepreneur Journeys Vol. 2; BookSurge; June 1, 2009; $16.95 paperback). Along with the incisive analysis and commentary that have popularized popularized her blog “Sramana Mitra on Strategy” and Forbes columns, Mitra showcases a dozen successful entrepreneurs and their lessons from the bootstrapping trenches. Overflowing with lively entrepreneurial tangents, theories and behind-closed-doors-experience, the book rises to the level of economic policy discussion while simultaneously offering practical advice from experienced bootstrappers. Important issues like doing more with less, getting started with little or no capital, and validating the market on the cheap are discussed with the likes of Om Malik of GigaOm and Greg Gianforte of RightNow. In her characteristic narrative style, Mitra shepherds established and aspiring entrepreneurs through another inspiring and page-turning expedition into venture land, a territory she hopes will be claimed by many more in the years to come. ABOUT THE AUTHOR: Sramana Mitra is a technology entrepreneur and strategy consultant in Silicon Valley. She has founded three companies, is a columnist for Forbes, and writes a business blog, Sramana Mitra on Strategy (www.sramanamitra.com). She has a master’s degree in electrical engineering and computer science from MIT. While angel investors are taking on venture capitalists and have last year invested as much as VCs did the VC deals show a decline in the first quarter of 2008. According to a new report from PricewaterhouseCoopers, venture capital investment in the United States headed south in the first quarter of 2008. The report found that venture capital has dropped 8.5 percent to $7.1 billion in the three months ending March 31 from the $7.8 billion invested in the previous quarter, resulting in the lowest quarter since Q4 2006. Funding for early and late stage companies declined in the first quarter, though funding rose for expansion-stage companies. Some sources claim that new startups are being hit the hardest. In more specific the VC money going into the software sector (including Internet, Web, IT) declined 9 percent quarter-over-quarter and flat year-over-year to $1.264B and is said to be equal with the amount invested in biotech companies ($1.267B). In perspective to the only Internet deals those declined 7 percent from the fourth quarter of 2007 to $1.310 billion, but were slightly up year-over-year. 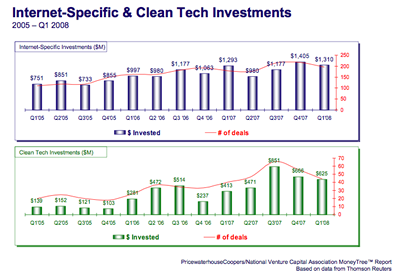 Clean tech investments have gone crazy and hit the peak in third quarter of 2007 during which period more than $851M was invested. In the context of web 2.0 it could simply be the fact that it is dirty cheap lately to start a new web-2.0 company online and the VC money offered to those is always a bit more than what this company in particular needs from to get off the ground and stabilize. This could be seen as a reason why the VC deals for Internet only start-ups have slightly declined in the last 2 quarters. Another potential reason of this slight meltdown could be the fact that the first quarter of the calendar year is usually the quietest so part of the decline may be seasonal. Yet, the most logical reason could be the overall economy meltdown in US, which might now have its impact over the VC market too. Today we have read over a few technology and business blogs that angel investors have poured $26B in start-up companies for the last year alone. Aside the fact this is an impressive amount of money it is also very close to what VCs did themselves – $29B. Furthermore the number of deals backed up by angels is way bigger than the number of deals venture capitalists closed – 57,120 vs. 3813 deals in behalf of the private investors. The sources also claim there are 258,200 active angel investors in the USA alone. The vast majority of the angel deals go for Software and Internet start-ups. Angel investors continue to be the largest source of seed stage and early stage start-up capital, with 39% of 2007 angel investments going there. Based on those reports it seems the angels most rely on mergers and acquisitions for their exits, while VCs are more inclined for IPOs. Basically angels tend to invest just like VCs do except they do smaller investments $200K to $2M and they do about 15 times as many deals as VCs. In most cases angels have the same investment criteria and expectations of significant returns as the VCs look for. The average deal size (seed stage) is about $250K. The larger angel groups in Silicon Valley and Boston do significantly more deals and invest between $350K and $600K per round, and maybe $1.5M to $2M per company. The conclusion here is that launching a start-up company and then getting it off the ground is a whole lot cheaper today then it used to be some years ago. This somehow leaves most of the traditional VCs out of the game since either angel investors are beating them or the large Internet players are buying those start ups far before the VCs get their hands over them. As Paul Graham from Y Combinator points out there is is growing gap between the $20K to $100k most angels will put in and the $2 million to $3 million that a venture firm will commit. He argues that what startups need are more investments somewhere in the middle to fill that gap. Most Web startups don’t need $2 million. They need $300,000 or $500,000. But most venture capitalists don’t think those types of investments are worth their while. Some very active angel pools are as follows Keiretsu Forum, Band of Angels, Beacon Angels, Boston Harbor Angels, Common Angels, eCoast Angels, Hub Angels, Launchpad among others. Here is an interesting list of tips for you on how to land an angel for your start up business. Mint.com, the site that helps you find better interest rates on bank accounts, credit cards, and other financial products. But here is the interesting part. The site officially launched in September 18, 2007, after nearly two years of development and significant private beta testing, and in just a few weeks, after being announced winner on TechCrunch40, the site took seriously off. In just 18 days, the company said, they had reached more than $2 billion worth of people’s personal financial accounts, and identified more than $40 million in potential savings for those members. In a moment Mint ended up having a new member every five seconds. It turned out that people really will do anything to save a buck. There were more than 50,000 accounts opened up. And logically the investors jumped in. Total funding in no time reached $5.5M for Mint Software. Today we have read over Internet that Mint is about to announce its third round of funding today – $12.1 million from new investor Benchmark Capital and all previous investors, including Shasta Ventures, Sherpalo Ventures, Felicis Ventures, Hite Capital and First Round Capital. The company has now raised a total of $17 million, most of it since October of 2007. Benchmark’s Bob Kagle is joining the Mint board. CEO Aaron Patzer says the company is adding 10,000 new users per week, has organized over $10 billion in purchasing activity and has identified around $100 million in savings opportunities for users. The company makes money via lead generations, and Patzer says users are clicking on presented opportunities 12-15% of the time. That all sound very good and promising but it also raises some concerns and the Mint’s independence different online users are already asking about. Mint is being accused already that they may be selling out trying to get deals with banks to connect to their system. When’s the last time you went to an ATM that let you take out $1.50, $2.00 or any amount under $20. Then it seems odd that Mint can’t distinguish and break out your ATM fees so you can see how much I spend. I don’t spend $101.50 on ATM fees, I spent $1.50. There are several very obvious things Mint could help with, but don’t. From the banks perspective they make a lot of money from ATM fees which costs them next nothing providing huge margins. So are they interested in cooperating with a service that makes points out that you are getting fleeced in ATM fees? It is being said there are more examples like this, one gets lousy interest on his/her savings – however somehow the only bank switch recommendations one gets are from CITI bank to … CITI Bank. Never a recommendation to switch to WAMU for example which would save the user $9.50/month in checking, and $20-30/month in ATM fees. Some users raise the point that Mint might be too much in bed with the banks to be anything other than an overview. Techcrunch has reported it has a source that told them venture capitalists were clamoring to get a piece of this deal, but the question here is does Mint really need that much money or it is all about the fact that VCs want to be in regardless what Mint’s real needs might be. Mint is the freshest, most intelligent way for you to manage your money online. Not only is Mint free, it saves you money. While existing personal finance software packages require hours to set up, a passion for accounting (is that possible?) and hours of weekly maintenance, Mint is virtually effortless. With Mint, you can be fully up and running in less than five minutes. After that, revolutionary, patent pending Mint technology does the rest, with virtually no more work required. It automatically pulls together your bank, credit union and credit card data, and provides up-to-date and amazingly accurate views of your financial life – from the big picture to specific details, in a friendly and intuitive way. In addition, Mint goes beyond visibility and analysis; providing personalized money-saving and money-making suggestions. Mint provides users an average of $1,000 in savings opportunities during their first session. Plus, Mint is proactive— alerting you when you are overbudget, have a low balance, need to pay a bill, and more. Mint is safe and secure: we never know your identity and we provide bank level data security. Mint is a modern, powerful, easy and secure web-based solution for managing your finances. And it’s free. You register anonymously using any valid email address, and then add the log-in information for the online bank, credit union and credit card accounts you want to consolidate in Mint. Mint connects to over 3,500 US financial institutions. Your account information is updated each night. Mint automatically categorizes all your purchases, showing you how much you spend on gas, groceries, parking, rent, restaurants, DVD rentals and more, with amazing precision. An advanced alerting system highlights any unusual activity, low balances, unwanted fees and charges, and upcoming bills so you’re in constant contact with your money – effortlessly. Mint goes way beyond just reporting. Using a patent-pending search algorithm, Mint constantly searches through thousands of offers from hundreds of providers to find the best deals on everything from bank accounts to credit cards; cable, phone and Internet plans, and more. Mint’s suggestions are “unique to you” as they are based on your individual spending patterns. For example, if you have $20,000 in a bank account that’s earning no interest, Mint might recommend a high interest rate savings account from ING or HSBC. Acting on that suggestion would give you an extra $900 in interest income over a year. Easy to use: You’re up and running in under five minutes. And Mint does virtually all the rest. Comprehensive: Mint provides detailed visibility into virtually all your financial relationships with a single, secure login. Constantly working to find you savings: Mint typically finds users $1,000 in savings opportunities in their first session – minutes after registering. And Mint keeps looking for new ways for you to save every day — continuously comparing your needs to product, service and bank offerings most relevant to you. Secure: Mint provides bank level data security and industry leading identity protection. Its security and privacy have been validated by VeriSign and TRUSTe. Always On: You’re automatically notified of upcoming bills, low balances, and any unusual activity in any of your accounts, through one (m)interface. Patent-pending categorization technology that automatically identifies and organizes purchases from descriptions in the electronic records at banks and credit card companies. A proprietary search algorithm which finds savings opportunities unique to each user. Mint’s technology does everything automatically in a way that other online banking applications and personal finance management software can’t. It provides useful information and smart, specific recommendations for saving or making more money based on each user’s individual purchase history. Today, after nearly two years of development and significant private beta testing, Mint is preparing to announce the public beta of Mint.com. The company has put together an experienced executive and engineering team, and has attracted funding from top tier venture capital firms and angel investors. Security is crucial when someone is dealing with your financial information and it is no wonder there were many debates surrounding Mint in the public space. We have dug information up ourselves and have found many interesting commentaries made by Mint’s CEO, which we enclose below. Below is what Aaron Patzer, Founder & CEO at Mint.com, has to tell about security. 3) Email & text-message alerts help identify fraud immediately… and being proactive is the best measure. I’ll make a bold statement: You’re safer on Mint then with online banking. On Mint, you’re completely anonymous. We never ask for a name, address, or SSN – just an email. We know about your finances…but not about you. We’re also independently verified by VeriSign, TRUSTe, and several outside agencies. We also have serious physical security. Our servers are in a secure, unmarked facility. To get in, you need to pass 3 biometric scanners, 4 locked doors, and several guards. We have our own cage so we’re physically separated from all other companies. Cameras monitor our servers and power supplies 24/7. The servers themselves have additional locks. The hard drives are encrypted. It’s like Mission Impossible (except without the electrified floors…maybe one day). Perhaps more interestingly, 90% of all fraud actually occurs offline, not online (e.g. someone swipes your card at a restaurant or from your mail). Because Mint sends proactive alerts for low-balance or unusually high spending, you’ll know right away. It’s better than logging into 4-5 different banks every day, or waiting 30 days for a paper statement before finding that something went wrong. Again, 90% of all fraud starts offline, for example when someone takes your credit card at a restaurant, or digs through your mail. Sadly, a large portion of fraud is actually committed by friends and family members. If there are any anomalies, Mint.com shows you right away. The alternative is to a) login to every single credit card, checking, and savings account every day to check for fraud, or b) wait 30 days until a paper statement arrives before noticing an issue. By taking a proactive approach, Mint.com actually helps protect you from the vast majority of fraud – better than just about any website out there. Consider that Quicken and Microsoft Money ask you for the exact same credentials as Mint.com, and have been for the past 10 years. MS Money even uses Yodlee to make it’s connection to banks (same as Mint.com, BofA, and Fidelity). The problem with those tools is they cost $30-$80, sunset their products every 2-3 years to force an upgrade, require an hour to setup, and take an hour a week to maintain. Mint is like an extension to online banking: pull all your accounts together in one place, finally see where your money goes, get alerts on anything out of whack, and find savings opportunities worth an average of $1,000/user. Mint never gives your information to third party advertisers. We have a proprietary database of financial offers, interest rates, and communications (phone, tv, internet, wireless) providers. The matching is done in software, anonymously. Your information never leaves Mint.com. If or when you click through on a savings opportunity, no information is passed except that the click came from Mint.com. Mint does make a small referral fee from advertisers on some offers. That’s what keeps Mint free. Whether we have a relationship with a provider in no way affects our ranking algorithm – we find users the best interest rate or lowest price regardless. What this means in the end is Mint only makes money if we can find ways for the user to save money. And we think that’s pretty revolutionary. The only ads you see are ads that make you money…think about how different that is as a business model. What the company, by that time, seemed not to be dealing with is the offers it makes are often not competitive with or comparable to what users are getting, mint is just having no way to know that! For example, I have a Capital One card with 1% back. You see my Capital One account with ? for a cash return, and “offer” me a 1% back card (a *savings* of $250/year!). There needs to be a way to user input the specifics of current accounts and products before you offer to “save” me all that dough! Mint has told by that time they are tackling the issue within the next month or so, they will be able to accurately capture the rewards earned on just about every credit card. Then, it will be able to accurately reflect the fact you are earning 1% back on your Capital One card. We were unable to dig something up from the public web as to whether this issue has been fixed or not. Some more drawbacks as we have found them around Web are as follows. You can’t import data to Mint in any way other than through your financial institution, meaning that if you’ve got years’ worth of financial data in Quicken, don’t count on importing it to Mint. That said, Mint can load over a year of your most recent financial data (depending on how long your institution provides it) when you sign up. On a similar note, Mint doesn’t export data—meaning if you decided to ditch Mint for another money management solution, you’re not going to get a CSV file or any other export of your data. The most notable and practical drawback to Mint came in the form of strangely named, incomplete transaction descriptions (the imported name was strange—the actual transaction name at the originating financial institution was more descriptive). As a result, I ran into problems setting up renaming rules for transactions in Mint. For example, a transaction that read in my checking account (at the actual US Bank web site) as “Web Authorized Payment AT&T” showed up in Mint as “Web Payment” or something along those lines. I set Mint to automatically rename this transaction to AT&T, but then every Web Authorized Payment in my account was renamed AT&T, although some were gas or water and power bills. Similarly, “Purchase with PIN” shows up in the ledger as “With,” which is not terribly helpful. Next to the all-in-one account integration, automation is Mint’s biggest draw—which means these sort of minor issues need worked out before you can set up renaming rules with complete confidence (especially since you can’t currently undo renaming rules). On the flip side, Mint claims to accurately identify and rename 90% of imported transactions without any need for user import, compared to Quicken’s 40% (their numbers). Aaron’s Financial Personality? Über-Frugal but lusting in his heart for expensive cars. Donna brings over twenty years’ experience in strategic management and marketing to the Mint team, with specific expertise in the financial services industry and online demand generation. She led client acquisition/retention, brand-building and product development for organizations ranging from start-ups to global brands – including Expedia, myCFO, Intuit, Charles Schwab and American Express. Prior to Mint, Donna was Senior Vice President of Marketing at Expedia, where she was responsible for strategic direction of the company’s brand, advertising, direct marketing, customer and partner marketing and market research. At Intuit, as Vice President of Corporate Marketing and acting CMO, she led the company’s corporate marketing functions and general marketing strategy. She also served as Vice President of Intuit’s Small Business and Personal Finance division, responsible for direct marketing, channel marketing and market research for the Quicken, QuickBooks and Small Business Services businesses. Donna joined Intuit from myCFO, Inc., where she was Chief Marketing Officer. She previously held senior positions at Charles Schwab, where she led marketing for segments representing 70% of all Schwab client households, and American Express, where she launched the Gold Rewards and Platinum Corporate Cards. Donna holds a MBA from Stanford University’s Graduate School of Business and a BS in Economics from the Wharton School at the University of Pennsylvania. She is a past Board member of the Financial Women’s Association of San Francisco and the Marketing 50. Donna’s spending personality: Unremarkable, except in her weakness for luxury hotels. David has over 10 years experience in building secure, distributed, fault-tolerant systems. David was most recently leading the development of server products for PGP, where he helped design, build and ship three major versions of the company’s flagship product: PGP Universal. Prior to PGP, he built a high-volume financial information product targeting online retail equity traders. David was on the server team at NetDynamics (acquired by Sun Microsystems), implementing core features for security, scalability, fault-tolerance, distributed load balancing, and performance. He has also worked at GeoCities, where he developed the company’s first capability to insert advertising banners on its pages. He has held several positions with Lawrence Livermore National Laboratory working on distributed systems and the WWW. David holds a M.S. in Computer Science with honors from Stanford University and a B.S. in Computer and Information Science from the New Jersey Institute of Technology. David’s Financial Personality? Conservative and analytic in all spending categories Dining Out. Major Foodie. Aaron brings over ten years’ of product development and product management experience to Mint. Prior to joining Mint, Aaron held several leadership positions at eBay and Half.com (acquired by eBay Inc.). Most recently, as Director of Advertising, Aaron was responsible for product strategy, design and product development. Aaron has a background in multivariate testing used to drive analytically-based decisions around product design, improved user experience and strategic partnerships. Prior to working in advertising, Aaron managed internet marketing and product management teams, focused on search engine marketing, search engine optimization and affiliate marketing. Aaron’s career in software was established at Kana Communications, Inc., a CRM software start-up. He holds a bachelor’s degree in Earth Sciences from University of California, Berkeley. Aaron’s spending personality: Frugal at heart. Focused on enjoying life in practice. Anton is responsible for Mint’s business strategy, revenue and partner development. Anton brings to Mint over 15 years of experience in the software and Internet sectors spanning legal, operations, marketing and business development roles. Prior to Mint, Anton was Vice President of Business Development at Right Hemisphere, the leader in visual product communications and collaboration. Prior to Right Hemisphere, Anton was Director of Business Development at Spotlife (Logitech) a pioneer in Web consumer video solutions. Anton began his career as an attorney working in London and Paris, and then in Palo Alto, California at Wilson Sonsini Goodrich & Rosati, the leading law firm for emerging growth high technology companies. He holds law degrees from the University of Auckland and the University of Montpellier, France. Anton’s Financial Personality? The ultimate deal-seeker and most passionate negotiator. We love having him run Biz Dev. Mint has been named Best of Show at the 2007 Financial Innovations conference. Mint has also been chosen as the best presenting company at TechCrunch40 and has won a $50,000 cash award. In December 28, 2007 Mint.com has also won the 2008 PC World 25 Most Innovative Products Award. Competitors and similar companies include BillMonk, Expensr, Wesabe, Zecco, Buxfer, SpendView, Geezeo, sMoneyBox, FreeAgentCentral, Covestor.com, Yodlee, wclipperz.com and passpack.com, among others. Of course, Intuit is the major player in the space. Forbes has assembled a very interesting list of some of the Silicon Valley’s most interesting and coolest innovations beyond the web start-ups. What is being said as a fact is that venture capitalists have poured over $30B into more than 2500 new ventures in 2007 alone. Some of them have to be non-traditional the media says and outlines some of those non-web start ups. The criteria to make the list were companies with unusual technologies or in surprising niches, which recently received additional rounds of venture financing and ranging from gadgets that only the military could love to ones that could wind up in your neighbor’s car. Insitu is a leading high-tech autonomous systems company. They currently produce and sell an ever growing fleet of Unmanned Aircraft Systems that are low-cost, long-endurance, and have low personnel requirements. These UASs provide a no-runway launch, unprecedented stabilized day and night video for ISR, robotic flight control, and a no-nets capture. Insitu began by creating long endurance Unmanned Aircraft to measure atmospheric conditions and do reconnaissance in remote areas for meteorology, daily weather prediction, and climate modeling. Aerosonde was the first aircraft developed by Insitu, noted for completing the first autonomous crossing of the Atlantic Ocean in 1998. From the Aerosonde, Insitu began to develop its Insight UAS platform, that is still being regularly upgraded and deployed today. 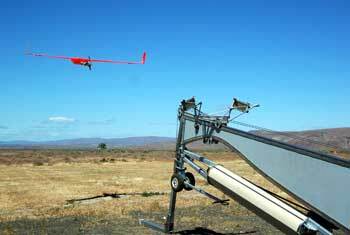 In 2001, Insitu began working with Boeing to develop ScanEagle, an ISR-focused Unmanned Aircraft System that is currently used by the US Navy, the US Marines, and the Australian Army. Insitu closed its Series D round of financing led by Battery Ventures’ Roger Lee in December 2007. The company has plans to release a new autonomous aircraft in 2008. Founded in 2001, Incesoft Technology Co., Ltd. is the world’s leading provider of web robot technology and intelligent interactive information platform. Incesoft is committed long term to the web robot development and research, providing various information and services for users at the same time giving them better interactive experience. At present Incesoft has made great achievements in the field of Chinese artificial intelligent analysis and information management service. Currently Incesoft has the largest Chinese-language web robot platform (www.xiaoi.com). The robots can be used on IM, WEB and Mobile platform, providing services as information, entertainment and E-commerce etc. about working and living. Meanwhile Incesoft also provides customer service robots for companies and governmental departments. Until now Incesoft has more than 20 million users. With many-years robot development experience and strong technological power, Incesoft became Microsoft’s global strategic partner in February 2006 and Incesoft Bot Platform became the official robot access platform for Windows Live Messenger. In addition, Incesoft is Tencent QQ (a popular IM tool in China) and Yahoo Messenger’s strategic partner as well. Draper Fisher Jurvetson and ePlanet Ventures were among the backers who pledged financing in March 2007. California-based A4Vision has developed a 3D facial imaging and recognition system that works in conjunction with its established fingerprint identification and verification technology. Clients include high-security outfits such as the U.S. Department of Defense and a Swiss bank. Bioscrypt, a company specializing in access control, acquired A4Vision in March 2007. Investors, including In-Q-Tel, the venture wing of the Central Intelligence Agency and Menlo Ventures, must feel secure. 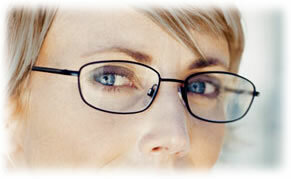 Ophthonix, Inc., a San Diego based vision correction company, is changing forever the way we see the world. Customized iZon® High Resolution Lenses allow wearers to see the world in High-Definition—clearer, sharper and more vividly than ever before. The proprietary and patented process is the first ever vision correction technology that addresses the problems associated with the unique variations in each person’s eyes, allowing for customized eyeglass lenses. The result is a detailed picture, much like your eye’s fingerprint. The iZon lens, custom-built to help reduce glare in nighttime driving, is the result. Kleiner Perkins Caufield & Byers was among investors who put $35.1 million into Ophthonix’s December 2006 Series D round. Dash Navigation has developed the Dash Express, which is an Internet-connected GPS device that offers route choices based on traffic information generated from other Dash Express devices and the Internet. Superior traffic with the Dash Driver Network™:Select your route based on up-to-the-minute traffic data that is automatically and anonymously exchanged via the most reliable source–other Dash devices. The Dash Express gathers traffic information from the Dash Driver Network and combines it with other sources of traffic data to provide you with the most accurate picture of what’s happening on the routes you’re travelling. 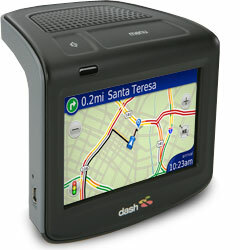 And, only Dash provides traffic information for freeways and local roads and side streets. Dash Express provides up to three routing options to your destination that are based on flow rather than incident data, and even has the ability to automatically alert you when traffic conditions change and a faster route is available. Find virtually anything with Yahoo!® Local search:Connect to Yahoo! Local search to find unlimited points of interest—people, places, products and services—based on your specific needs. Two-way connectivity gives Dash Express the ability to use Yahoo! Local search and other internet search sources to find almost anything anywhere. Unlike other GPS devices that come loaded with a static database of points of interest, Dash gives you access to unlimited points of interest based on your specific needs. MyDash makes it even easier to personalize your Dash Express:MyDash, available at my.dash.net allows you to create and send customized search buttons straight to your device so you always have access to the places you want to go. And you can even take advantage of local knowledge from the Dash network by downloading location lists shared online by other users. AutoUpdate™ means a GPS that’s always up to date:Dash Express is the only GPS that automatically and wirelessly updates software and traffic using two-way connectivity. You’ll always have the latest and greatest features as we release them. With Dash you are always up to date! The company secured $25 million in February 2007 from investors, including Sequoia Capital and Kleiner Perkins Caufield & Byers. 3DV Systems is a pioneer and world leader in the three-dimensional video imaging industry. Established in 1997 and headquartered in Yokne’am, Israel, the company has developed a unique proprietary technology which enables video cameras to capture the depth dimension of objects in real time, high speed and very high resolution. The company has developed a unique patented technology which enables cameras to capture the depth dimension of objects in real time, high speed and very high resolution, using low or no CPU resources. 3DV markets, in a fab-less OEM model, a chipset that can be integrated to create systems and solutions for multiple applications as well as the new ZCamTM (previously Z-Sense) family of 3D cameras. 3DV was founded by Dr. Giora Yahav and Dr. Gabi Iddan, two veteran scientists of Rafael, Israel’s leading defense industry. Leveraging their experience and know-how gained through leading development of electro-optics missile technology, they came up with a ground-breaking concept of measuring distance from objects using the Time-of-Flight principle. Since the successful completion of the development of our first 3D camera directed at the broadcast studio market, the new ZCamTM (previously Z-Sense), in 2000, 3DV was able to dramatically reduce the size and decrease the cost of its technology thus widening the scope of markets and applications and currently reaching consumer markets. The company’s latest prototype camera, the new ZCamTM (previously Z-Sense), is at the size of a typical webcam, and provides home users revolutionary gesture recognition capabilities in addition to real-time background replacement, enabling them to control video games and personal space through intuitive body gestures and immerse themselves with virtual reality. Kids may be excited about a new way to play. Adults, by contrast, may appreciate how the technology can be applied to reality: video cameras in their cars. The cameras can detect signs of fatigue, alerting the driver, or help to safely deploy airbags based on the exact location of passengers’ head. Kleiner Perkins Caufield & Byers and Pitango Venture Capital led the $15 million investment round in December 2006. In answering those questions – and finding a solution for the problem – HyperActive Technologies looked closely at the processes of quick-service restaurants, and has brought a full array of vision, prediction, and task-management technologies to bear in an industry where competition is fierce and quality is the number one differentiator. Vision: advanced real-time vision technologies monitor customer arrivals constantly and without wavering. Prediction: Powerful processing tools learn from historical and real-time sales, incorporating the results of this analysis into real-time task management. Action: easy-to-read touch screen monitors tell cooks precisely what to cook, and when to cook it. HyperActive Bob is the Predictive Kitchen Management System that tells cooks what to cook, and when to cook it, assuring that all of your operations perform as smoothly as your best! Drive-thru Speed of Service Timer is the first of its kind tool to measure the amount of time drive-thru customers spend in line before they reach the order board! Walk-in Demand Prediction provides Bob’s keen demand prediction for restaurants that may not have vehicle entries. HyperActive Technolgies is based in Pittsburg and is a privately held company. Last May, the company purchased QTime solutions, a drive-thru timer to help speed up how Hyperactive develops its recommendations. Private angel investors organized by Spencer Trask Ventures presumably had a quick meeting to decide to put $8.5 million into the firm in 2006. Basically it is becoming clear that not all VC money goes to sites a la Facebook, yet the US economy is not in its best state today to accommodate and absorb some of these great inventions and innovations. 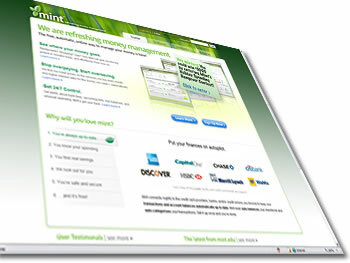 First off, Mint.com is a neat, well organized and professional web site to put your finances under control. Explained in layman terms Mint helps you find better interest rates on bank accounts, credit cards, and other financial products. But here is the interesting part. The site officially launched in September 18, 2007, after nearly two years of development and significant private beta testing, and in just a few weeks, after being announced winner on TechCrunch40, the site took seriously off. In just 18 days, the company said, they had reached more than $2 billion worth of people’s personal financial accounts, and identified more than $40 million in potential savings for those members. In a moment Mint ended up having a new member every five seconds. It turned out that people really will do anything to save a buck. There were more than 50,000 accounts opened up. And logically the investors jumped in. Total funding in no time reached $5.5M for Mint Software. Institutional investors include Shasta Ventures and First Round Capital and the company’s angel investors are Josh Kopelman, Rob Hayes, Tod Francis, Ron Conway, Mark Goines, Geoff Ralston, Jeff Clavier, Sy Fahimi and the last but not least Ram Shriram. Some of the angels are top executives from eBay, Intuit, Google, Yahoo, Charles Schwab, Wilson Sonsini, Reuters, Adteractive, and Weblogic/BEA. Under no doubt it is not every day you can see such a jumpstart for a start-up company. The company’s founder Aaron Patzer has an interesting story to tell about one of his angels – Ram Shriram (an early Google investor). Ram Shriram actually came in about a month after we closed our round. At the time we only had about $200k open in the round. Unlike most investors (who wait a week, talk to their friends, bring you back for multiple meetings), Ram said “Okay, I’m in” before I was done with the presentation. He then explained that he had no upper limit on what he could invest (good problem to have! ), but that his accountants lose track if he doesn’t invest at least $500k. So needless to say, we opened the round up a bit. Today, just a few months later, Mint claims to have already well over 100,000 registered members (accounts) and is now organizing $6 billion in user transactions, and has identified nearly $90 million in savings opportunities. The company says users are telling them, via their rapid adoption and through survey feedback, that Mint.com is enabling them to do more with their money. Mint.com’s first customer survey, conducted in December, 2007, shows that 87% of respondents feel they better understand their spending after using Mint. And nearly half of them have changed their spending behavior as a result of what they’ve learned. * the most frequent change being eating and drinking at home more often. MyLifeBrand, the social network that offers private label solutions for online community-building, has received $750,000 in seed money. However, the angel investors were not disclosed. We have also read on a few blogs the company is still looking to raise more in another round, for an unspecified amount. In addition to creating online communities for established groups, the site allows users to manage their accounts at various social networking sites. Both sides of the business face plenty of competition. From what we have read below the company is brining in $300,000 in revenues and is on its way to $1M for its first year of operations. The site itself is very modest on what the company is doing. MyLifeBrand, the site says, is a new site offering the next generation of social networking and social media services. Digging further one understands that it’s got a profile aggregation tool, a group-formation tool, private label options and more. In this way, it looks to appeal to individuals that already have existing profiles on other networks, those that would like to create their own network, businesses that are looking to offer an online group for networking purposes, and businesses that would like to incorporate social networking modules into their existing website. It is also said that MyLifeBrand has teamed up with the Utah Jazz to offer a branded social network for team fans. The company is based in Seattle, Washington but the firm is currently in the midst of moving down to Southern California. The company was in talks with local investors, and also has all of its business development folks there in Los Angeles. Here is what the firm’s Executive Vice President Daniel Scalisi has stated in an online interview with socalTECH’s Ben Kuo. Daniel Scalisi explained MyLifeBrand was created to solve a few problems we saw in the market, and to take advantage of the opportunities. At the core, MyLifeBrand is a social browser platform. It’s a website that allows users to manage external and internal communities. That includes MySpace, Facebook, and LinkedIn. The internal communities’ pieces are being created on our platform by companies who are looking to engage their member base. It’s a single platform, where you can seamlessly navigate your external and internal sites they may want to join. What we recognize, is that people are part of multiple social networks. We are trying to create a single browsing experience for managing someone’s social life. For communities, who have recognized that their member bases are going to social networks which allow them to create their own groups around associates or companies, why shouldn’t they find a way to engage their member base in a similar form? We launched in June of this year (2007), and were in Alpha mode until August, when we went into beta. Typically, our focus has been on building membership, where we have been partnering with communities of interest–faith based, nonprofit, sports, entertainment, and other communities by providing a free community tools platform. We’re essentially seeding our member community with their member base. That way, we are adding people thousands as a time, rather than as individuals. On the other side, we have started a search engine optimization and search engine marketing push to drive adoption from the individual user side. That’s really what our platform does–number one, it’s a service which provides free aggregation, browsing, and syndication of all of your communities, social networking sites, and services. Number two, it’s a customizable tool to create a community; and number three, it’s a marketing platform that communities and users can leverage to market their own community and build membership. The community is advertising based. Unlike other social networking sites, if you’re helping to drive traffic, we’re giving you a percentage of revenue. Individuals actually get rewarded in a number of ways, including converting rewards to cash, and for things like building their friends list. The company has been in stealth mode for the past year, building out the platform. We brought in alpha testers, and have been shaping the user experience based on user feedback. We went live publicly in June (2007), announcing our platform. To date, we’ve raised three quarters of a million in seed funding, and have another quarter million committed. Since June, we’ve been producing revenues, and have accrued $300,000 in revenues so far. We expect to have more than $1M in revenues for our first year. In parallel with our bridge round of $1M, we’re now seeking a Series A. From a technology standpoint, we’re based in Seattle, but from a business development and marketing background, we’re based in Los Angeles. Jeff Jani, our CEO, is out of Disney, and he built and sold a company around some unique technology to Microsoft. I myself, have built three different startups–this is my fourth–all of them in the digital media/Internet space. Some of the rest of the team come from Kintera, which is a SoCal company, and our other folks have deep community building experience through their own prior experience as well. In a new round of funding Hakia, the natural language processing search engine has raised additional $5M. The money came from a previous investor, some of which are Noble Grossart Investments, Alexandra Investment Management, Prokom Investments, KVK, and several angel investors. With plans of fully launching some time next year, Hakia has been working towards improving its relevancy and adding some social features like “Meet the Others” to their site. Hakia is known to have raised $11 million in its first round of funding in late 2006 from a panoply of investors scattered across the globe who were attracted by the company’s semantic search technology. As far as we know, the company’s total funding is now $16M. We think that from all alternative search engines, excluding Ask.com and Clusty.com, Hakia seems to be one of the most trafficked engines with almost 1M unique visitors as we last checked the site’s publicly available stats. If it is us to rank the most popular search engines I would put them the following way: Google, Yahoo, Ask.com, MSN, Naver, some other regional leaders, Clusty and perhaps somewhere there is hakia going. On the other hand and according to Quantcast, Hakia is basically not so popular site and is reaching less than 150,000 unique visitors per month. Compete is reporting much better numbers – slightly below 1 million uniques per month. Considering the fact the search engine is still in its beta stage these numbers are more than great. However, analyzing further the traffic curve on both measuring sites above it appears that the traffic hakia gets is sort of campaign based, in other words generated due to advertising, promotion or PR activity and is not permanent organic traffic due to heavy usage of the site. In related news a few days ago Google’s head of research Peter Norvig said that we should not expect to see natural-language search at Google anytime soon. We think (Google) what’s important about natural language is the mapping of words onto the concepts that users are looking for. To give some examples, “New York” is different from “York,” but “Vegas” is the same as “Las Vegas,” and “Jersey” may or may not be the same as “New Jersey.” That’s a natural-language aspect that we’re focusing on. Most of what we do is at the word and phrase level; we’re not concentrating on the sentence. We think it’s important to get the right results rather than change the interface. In other words, a natural-language approach is useful on the back-end to create better results, but it does not present a better user experience. Most people are too lazy to type in more than one or two words into a search box anyway. The folks at both Google and Yahoo know that is true for the majority of searchers. The natural-language search startups are going to find out about that the hard way. Founded in 2004, hakia is a privately held company with headquarters in downtown Manhattan. hakia operates globally with teams in the United States, Turkey, England, Germany, and Poland. The Founder of hakia is Dr. Berkan who is a nuclear scientist with a specialization in artificial intelligence and fuzzy logic. He is the author of several articles in this area, including the book Fuzzy Systems Design Principles published by IEEE in 1997. Before launching hakia, Dr. Berkan worked for the U.S. Government for a decade with emphasis on information handling, criticality safety and safeguards. He holds a Ph.D. in Nuclear Engineering from the University of Tennessee, and B.S. in Physics from Hacettepe University, Turkey.